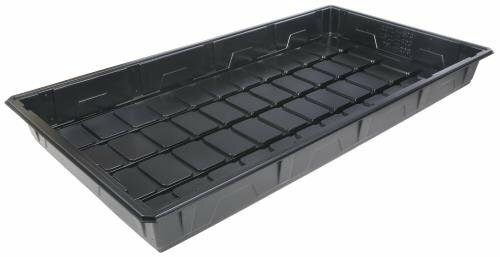 Flo-N-Gro’s line of Premium ID (Inside Dimension) trays are built to provide top quality performance for your growing needs. Extra thick, heavy duty, premium, long-lasting plastic trays feature an easy-to-clean square pattern that also drains more easily. The 3 ft x 6 ft, 4 ft x 4 ft and 4 ft x 6 ft models feature 5 mm material thickness, the 4 ft x 8 ft models are 6 mm. Built for rigorous use, the trays feature heavy duty design qualities that include gusseting in all necessary areas. Made with a proprietary blend of premium material. Manufactured in North America. If you have any questions about this product by Flo-n-Gro, contact us by completing and submitting the form below. If you are looking for a specif part number, please include it with your message.